Curated by the wellness experts at HoMedics, Ellia essential oils are a premium line of therapeutic-grade essential oils that are designed to reduce stress, boost mental clarity, and soothe your body and mind. Our essential oils are sourced from all over the world after a meticulous process of careful and conscientious research to identify the best regions for each aroma. We work with a global network of farmers who harvest our plants at their peak to collect their natural essential oils. The plants are either cold-pressed or steam-distilled to their very essence before undergoing rigorous testing – all so you can experience their natural effects and benefits. 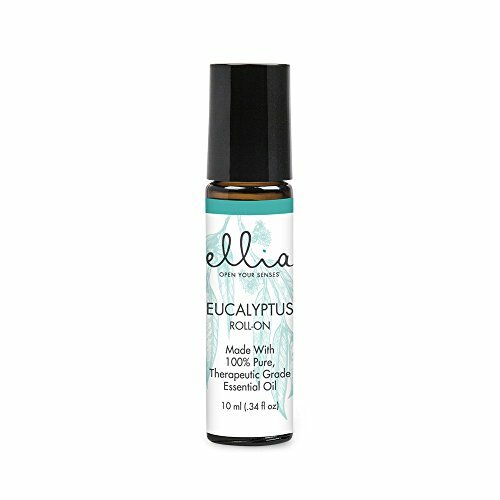 Ellia Eucalyptus Essential Oil Roll-On is cleansing and calming. To enjoy, simply remove the cap of the bottle and apply the essential oil blend to pulse points, such as your temples, back of your neck, or the soles of your feet. The active oil and predominant scent in this essential oil blend is Eucalyptus, which is warm and woodsy – great for opening up your sinus’ and encouraging deep breathing during seasons of allergies. However, the essential oil experts at Ellia have expertly blended Eucalyptus with a carrier oil base so it is ready to use straight from the bottle. Use this oil blend therapeutically to help you relax or simply wear it as a pleasant, all natural perfume! Our Eucalyptus essential oil roll-on is bottled exclusively in the USA. Our dark violet or amber glass bottles protect the essential oil’s precious properties. Most oils have a shelf life of 18–24 months, if not longer. To extend the shelf life of your oils, store in a cool, dry place with the cap tightly closed. If you have any questions about this product by Ellia, contact us by completing and submitting the form below. If you are looking for a specif part number, please include it with your message.